Fellow Svengoolie SvenPals everywhere will be jumping for joy about his big broadcast premiere of a rare Columbia Pictures horror classic. Sidebar: As of this writing, the original Columbia theatrical trailer to “The Son of Dr. Jekyll” (1951) is unavailable on YouTube or any other online video service platform. -C.H. 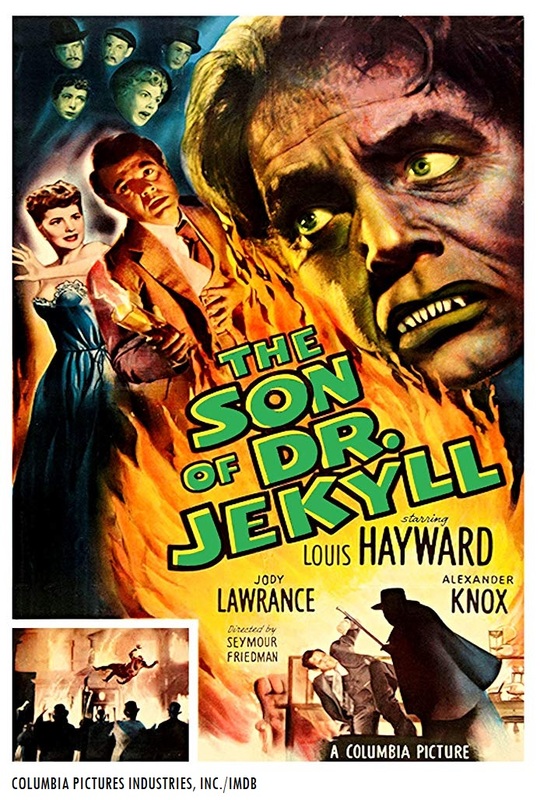 Original Columbia Pictures theatrical poster artwork for “The Son of Dr. Jekyll” (1951). The legendary Berwyn/Chicago-based horror film host will present his big broadcast premiere of “The Son of Dr. Jekyll” (1951), this Sat., April 13 at 8 p.m. Eastern/7 p.m. Central on Me-TV. “The Son of Dr. Jekyll” (1951) was directed by Seymour Friedman, who also worked on two films in Columbia’s “Boston Blackie” mystery film adaptation series with Chester Morris; “Trapped by Boston Blackie” (1948) and “Boston Blackie’s Chinese Venture” (1949). Friedman later served as a production manager for Columbia’s “Screen Gems” television unit. He supervised numerous episodes of “Father Knows Best” (from 1958-60), “Hazel” (from 1961-66), “Bewitched” (from 1964-66), “I Dream of Jeannie” (from 1965-66) and the pilot episode of “The Monkees” (1966). The screenplay for “The Son of Dr. Jekyll” (1951) was written by Mortimer Braus, a veteran Columbia B-unit screenwriter and Jack Pollexfen, a former newspaper reporter. Braus and Pollexfen’s screenplay was a loose continuation of Robert Louis Stevenson’s novel, “The Strange Case of Dr. Jekyll and Mr. Hyde.” Some of the well-known screen adaptations of Stevenson’s thriller were John S. Robertson’s 1920 Paramount adaptation of “Dr. Jekyll and Mr. Hyde” with John Barrymore as Henry Jekyll/Mr. Hyde, Rouben Mamoulian’s Academy Award-winning 1931 Paramount adaptation with Frederic March and Victor Fleming’s 1941 Metro-Goldwyn-Mayer adaptation with Spencer Tracy. Who was in “The Son of Dr. Jekyll” (1951)? The players who appeared in Friedman’s 1951 Columbia horror production were Louis Hayward (in the dual roles of Edward Jekyll/Mr. Hyde), Jody Lawrance (as Lynn Utterson), Alexander Knox (as Dr. Curtis Lanyon), Lester Matthews (as Sir John Utterson), Gavin Muir (as Richard Daniels), Paul Cavanagh (as Inspector Stoddard), Rhys Williams (as Michaels) and a young Hamilton Camp (in an uncredited role as William Bennett). Fellow Svengoolie SvenPals everywhere will be excited about his upcoming big broadcast showcase of a classic Universal Studios monster cavalcade with several monster cinema legends. 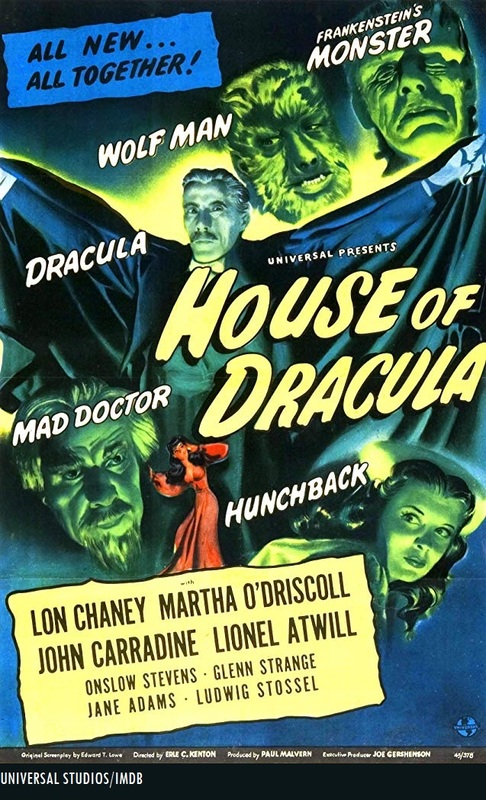 Theatrical trailer for Universal Studios’ “House of Dracula” (1945), altered for Realart Pictures’ latter re-release. Original Universal Studios poster art for “House of Dracula” (1945). The legendary Berwyn/Chicago-based monster film host will present his big broadcast of “House of Dracula” (1945), this Sat. ; April 6 at 8 p.m. Eastern/7 p.m. Central on Me-TV. “House of Dracula” (1945) was directed by veteran actor-turned-director Erle C. Kenton. Kenton also directed the Paramount screen adaptation of H.G. Wells’ “Island of Lost Souls” (1932). The director’s other Universal features include two Bud Abbott and Lou Costello comedy films, “Who Done It?” and “Pardon My Sarong” (both 1942). Kenton also worked on two previous Universal monster productions, “Ghost of Frankenstein” (1942) and “House of Frankenstein” (1944). This will mark Sven’s sixth big broadcast showcase of “House of Dracula” (1945) on Me-TV. He previously showcased the 1945 Universal monster entry back in April 2011*, July 2012*, June 2013, Feb. 2014 and July 2016.
Who was in “House of Dracula” (1945)? The players who appeared in “House of Dracula” (1945) were John Carradine (as Count Dracula, a.k.a. Baron Latos), Lon Chaney Jr. (as Larry Talbot/the “Wolf Man”), Glenn Strange (as Frankenstein’s monster), Jane Adams (as Nina), Lionel Atwill (as Inspector Holtz), Martha O’Driscoll as Miliza Morelle, Onslow Stevens (as Dr. Franz Edelmann), Skelton Knaggs (as Steinmuhl), Ludwig Stossel (as Siegfried), Jane Nigh and Harry Lamont (in uncredited roles as villagers). Fellow Svengoolie SvenPals will be jumping for joy for his big broadcast premiere of a classic Warner Bros. thriller with one of cinema’s macabre legends. 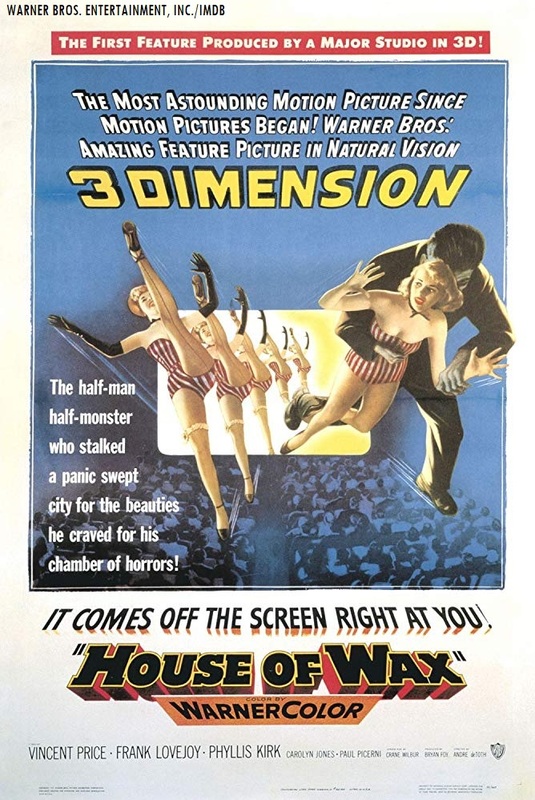 The legendary Chicago/Berwyn-based horror/thriller film host will present his big broadcast premiere of “House of Wax” (1953), this Sat., March 30 at 8 p.m. Eastern/9 p.m. Central on Me-TV. The 1953 Warner Bros. horror-thriller masterpiece was directed by actor-turned-director Andre de Toth. He later directed several television series for Warners, including one episode of “Maverick” (1960, w/James Garner), several episodes of “77 Sunset Strip” (1959–60), “Hawaiian Eye” (1959–60) and an episode of “Bronco” (1960, w/ Ty Hardin). “House of Wax” was produced by veteran producer Bryan Foy, who was part of the original “Seven Little Foys” family vaudeville troupe with his father, Eddie Foy. The screenplay for “House of Wax” was written by Crane Wilbur and was based off of a story by Charles S. Belden. Who was in “House of Wax” (1953)? The Players who appeared in “House of Wax” were Vincent Price (as Prof. Henry Jarrod), Phyllis Kirk (as Sue Allen) Frank Lovejoy (as Det. Lt. Tom Brennan), Carolyn Jones (as Cathy Gray), Paul Picerni (as Scott Andrews), Angela Clarke (as Mrs. Andrews), a young Charles Bronson (as Igor, Bronson was credited under his original name of Charles Buchinsky), Roy Roberts (as Matthew Burke), Dabbs Greer (as Sgt. Jim Shane), Paul Cavanagh (as Sidney Wallace) and Reggie Rymal (as a Barker). Fellow Svengoolie SvenPals everywhere will be looking forward to his upcoming big broadcast of a classic Paramount Pictures sci-fi adventure-fantasy thriller. Altered teaser trailer for the Paramount production of “Dr. Cyclops” (1940). Note how there is a gray block (around the 0:47 mark), masking the reference to Paramount (a result of MCA-Universal’s latter ownership of the pre-1948 Paramount sound features). The legendary Berwyn/Chicago-based sci-fi/thriller film host will present his big broadcast of “Dr. 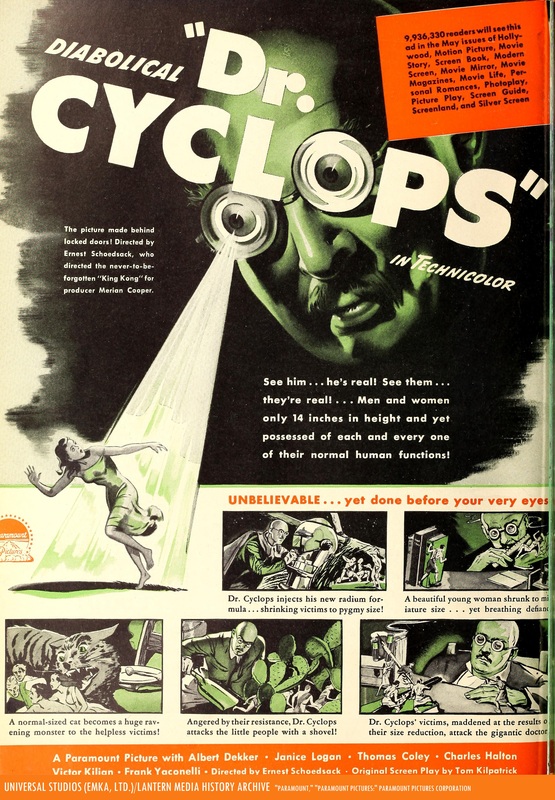 Cyclops” (1940), this Sat., March 23 at 8 p.m. Eastern/7 p.m. Central on Me-TV. The 1940 Paramount sci-fi fantasy-adventure thriller was directed by veteran director Ernest B. Schoedsack and was produced by veteran producers Merian C. Cooper (who was uncredited in the 1940 production) and Dale Van Every. Seven years earlier, Schoedsack and Cooper worked on their own successful monster classic for RKO Radio Pictures, “King Kong” (1933) and the sequel, “Son of Kong” (1933). The veteran director developed the idea for “Dr. Cyclops” on extensive storyboards with a series of blueprints. Schoedsack’s sci-fi thriller was originally slated to be part of a Paramount anthology series of thriller features, according to the American Film Institute’s database article on “Dr. Cyclops” (1940). This will mark Sven’s seventh telecast of “Dr. Cyclops” (1940) on Me-TV. He previously showcased Schoedsack’s Paramount sci-fi thriller back in Nov. 2011*, Sept. 2012*, April 2013, March 2014, Jan. 2016 and Dec. 2017.
Who was in the 1940 Schoedsack-Paramount sci-fi thriller? The players who appeared in Schoedsack’s production of “Dr. Cyclops” (1940) were Albert Dekker (as Dr. Thorkel), Janice Logan (as Dr. Mary Robinson), Paul Fix (as Dr. Mendoza, Fix was later known for his role of Marshal Micah Torrance on the 1958-63 Chuck Connors TV western series, “The Rifleman”), Thomas Coley (as Bill Stockton), Charles Halton (as Dr. Bullfinch), Frank Reicher (as Professor Kendall), Frank Yaconelli (as Pedro) and Victor Kilian (as Steve Baker). Fellow Svengoolie SvenPals from coast-to-coast will be excited about his upcoming big broadcast premiere of a classic cult sci-fi fantasy thriller. Original Jack H. Harris (Harris Enterprises)/Universal Studios theatrical trailer for “4D Man” (1959). Original Jack H. Harris/Universal Studios poster artwork for “4D Man” (1959). The legendary Berwyn/Chicago-based sci-fi film host will present his big broadcast premiere of “4D Man” (1959), this Sat., March 16 at 8 p.m. Eastern/7 p.m. Central on Me-TV. 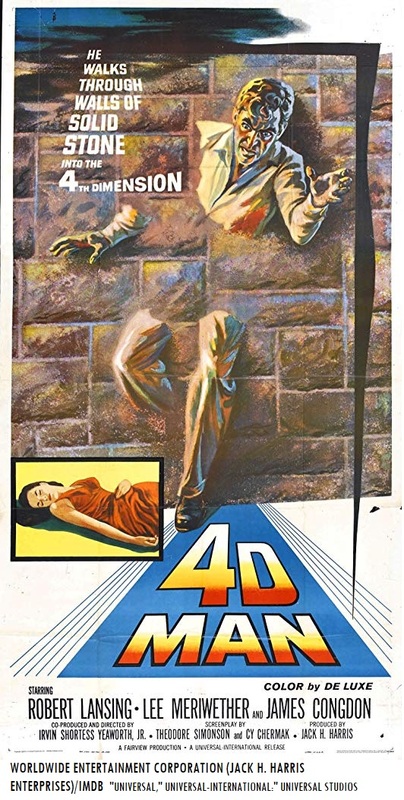 “4D Man” (1959) was directed by Irvin S. Yeaworth Jr. and was produced by Jack H. Harris, under Harris’ “Fairview Productions” moniker. One year before “4D Man,” Harris and Yeaworth worked on their mammoth sci-fi hit, “The Blob” (1958, originally released theatrically by Paramount Pictures); with a young Steve McQueen and Aneta Corsaut . The Harris-Yeaworth production of “4D Man” was originally released theatrically by Universal Studios in 1959. One year later, Universal handled the theatrical release of Harris and Yeaworth’s fantasy creature feature, “Dinosaurus!” (1960); with Ward Ramsey, Kristina Hanson and Gregg Martell. Who was in “4D Man” (1959)? The players who appeared in “4D Man” were Robert Lansing (as Dr. Scott Nelson), Lee Meriwether (as Linda Davis), Patty Duke (as Marjorie Sutherland), James Congdon (as Dr. Tony Nelson), Robert Strauss (as Roy Parker), Edgar Stehli (as Dr. Theodore W. Carson), Guy Raymond (as Fred), Chic James (as a “B-Girl”), Elbert Smith (as Capt. Rogers), George Karas (as Sgt. Todaman, Karas was credited as “George Kara” in the film) and Jasper Deeter (as Mr. Welles). Fellow Svengoolie SvenPals everywhere will be excited about his upcoming showcase of a classic Universal Studios horror-mystery-comedy adaptation of an earlier studio mystery-thriller feature classic. Original Universal Studios poster artwork for “The Black Cat” (1941). The legendary Chicago/Berwyn-based thriller film host will present his big broadcast showcase of “The Black Cat” (1941), this Sat., March 2 at 8 p.m. Eastern/7 p.m. Central on Me-TV. 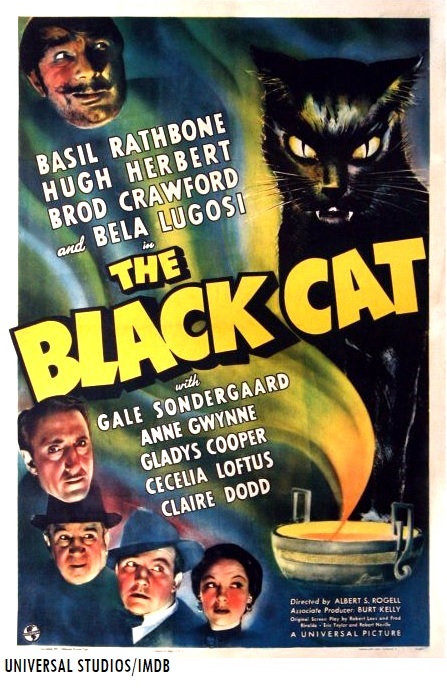 The 1941 Universal edition of “The Black Cat” was directed by Albert S. Rogell and was inspired by Edgar Allan Poe’s story of the same name. Seven years earlier, Edgar G. Ulmer directed his own Universal dramatic horror-crime-adventure screen adaptation of Poe’s “The Black Cat” (1934, with Boris Karloff, Bela Lugosi, Lucille Lund and John Carradine). This will mark Sven’s third coast-to-coast showcase of Rogell’s 1941 Universal adaptation of “The Black Cat” on Me-TV. Sven previously showcased the 1941 version of “The Black Cat” back in Sept. 2014 and Nov. 2016.
Who was in “The Black Cat” (1941)? The players who appeared in Rogell’s Universal edition of “The Black Cat” (1941) were Basil Rathbone (as Montague Hartley), Bela Lugosi (as Eduardo Vigos), Gale Sondergaard (as Abigail Doone), Alan Ladd (as Richard Hartley), Anne Gwynne (as Elaine Winslow), Hugh Herbert (as Mr. Penny), Broderick Crawford (as Hubert Smith), Gladys Cooper (as Myrna Hartley), Cecilia Loftus (as Henrietta Winslow), Claire Dodd (as Margaret Gordon) and John Eldredge (as Stanley Borden). Fellow Svengoolie SvenPals everywhere will be looking forward to his upcoming big broadcast of a legendary Universal Studios underwater monster feature classic. The legendary Berwyn/Chicago-based monster film host will present his big broadcast of “Creature from the Black Lagoon” (1954), this Sat., Feb. 16 at 8 p.m. Eastern/7 p.m. Central on Me-TV. The 1954 Universal monster classic was directed by veteran studio director Jack Arnold (Arnold’s additional Universal features include the studio’s first 3-D production, “It Came from Outer Space” in 1953; “Tarantula” in 1955, “The Incredible Shrinking Man” in 1957 and “Monster on the Campus” in 1958). Arnold’s “Creature From the Black Lagoon” (1954) was produced by veteran Hollywood actor-turned-producer William Alland. 13 years earlier, Alland played the role of Jerry Thompson in Orson Welles’ critically-acclaimed RKO Radio Pictures/Mercury Players drama, “Citizen Kane” (1941). After the success of “Creature From the Black Lagoon” in 1954, Universal produced and released two more features in the studio’s “Creature” monster franchise; ““Revenge of the Creature” (1955, directed by Arnold in 3-D) and the final production in Universal’s “Creature” trilogy, “The Creature Walks Among Us” (1956, directed by John Sherwood). 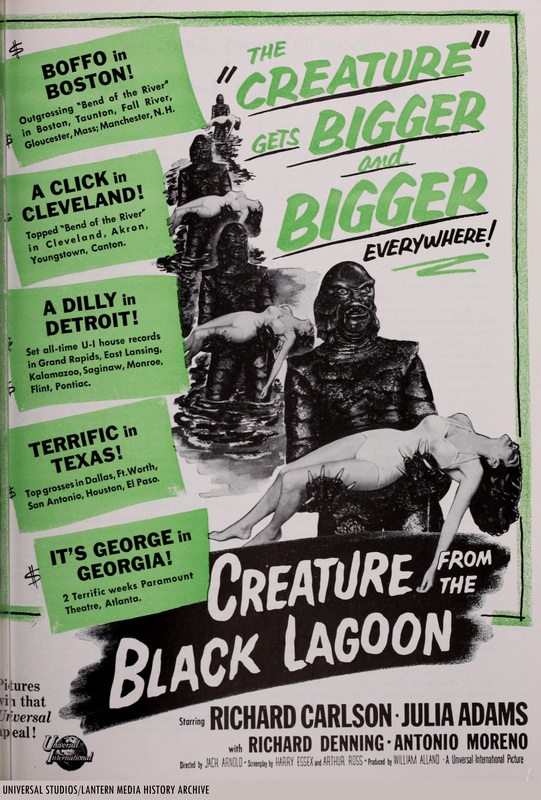 This will mark Sven’s seventh big broadcast showcase of “Creature from the Black Lagoon” (1954) on Me-TV from coast-to-coast. He previously showcased Arnold’s Universal monster-creature classic back in April 2011*, May 2012* (according to fellow super SvenPal David Fuentes’ official “Terror From Beyond the Dave” YouTube channel and Edward Reed’s “Svengoolie Fan Club” forum website), July 2014, Nov. 2015, July 2017 and Dec. 2018.
Who was in “Creature from the Black Lagoon” (1954)? Original Universal Studios theatrical release trailer for “Creature from the Black Lagoon” (1954). The players who appeared in “Creature from the Black Lagoon” (1954) were Julie Adams (as Kay Lawrence, Adams received screen credit under the name of “Julia Adams”), Ricou Browning (who appeared in an uncredited role in the “Creature” outfit for underwater-based scenes), Ben Chapman (who appeared in an uncredited role in the “Creature” outfit for land-based scenes), Richard Carlson (as David Reed), Richard Denning (as Mark Williams), Nestor Paiva (as Lucas), Antonio Moreno (as Carl Maia), Whit Bissell (as Dr. Thompson), Henry A. Escalante (as Chico, Escalante received screen credit under the name of “Henry Escalante”) and Bernie Gozier (as Zee). Pre-recorded encore in select theaters from coast-to-coast (including Frederick) on Wed., April 24!